Fort Vale is launching a new range of 80mm flanged relief valves aimed at the intermodal market. The Hyper Maxi valve is the result of extensive research, development and testing and will offer users unparalleled flow performance predictability. It is approved by Lloyd’s Register and has patents pending on the design of a new integral safety feature. Fort Vale made a significant financial investment in a purpose-built test laboratory at its UK headquarters. The gas flow rig is designed to BSEN4126 and ASME VIII Div.1 and is approved and certified by Lloyd’s Register. Devised to test relief valves with a maximum flow rate of 6.1 Nm3/s at 5.28 Bar, it has allowed the company to assess accurately and quickly any combination of relief valve and ancillary item that may affect flow, within the limitations of the test rig. Fort Vale believes that this is an unrivalled facility that allows it to make a unique contribution to the universal safety of tank containers. The company conducted a detailed analysis of the operation and flow characteristics of its entire range of relief valves. This is believed to be the most comprehensive study ever undertaken on valves and systems for intermodal tanks and has brought about an enhanced practical understanding of valve operating conditions, particularly with regard to de-ration factors for ancillary parts, such as gauzes and burst discs. When a tank builder is determining a relief valve flow requirement, the calculation is based on a valve fitted with a burst disc and gauze to allow for maximum de-ration, even if no ancillary parts will be fitted eventually. Witness testing has proved that the flow rate of an 80mm Hyper Maxi relief valve, both with and without de-ration factors, meets current regulatory requirements and, at the time of going to press, exceeds all current published comparative flow rates of relief valves by other manufacturers. The Hyper Maxi series of 80mm relief valves will offer a range of pressure settings from 3 psi up to 204 psi (0.21 Bar to 14.07 Bar) and vacuum settings from 0.5”Hg to 24”Hg (0.02 Bar to 0.81 Bar). There are three body styles; standard, short extended and long extended, each with a slotted flange to facilitate four common drilling patterns. 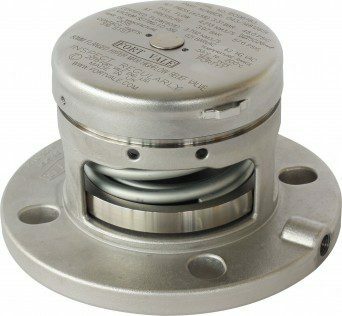 The valve body and port geometry has been optimised and now incorporates a ‘lift stop’, which is subject to a patent application and which enables the valve’s pressure plate lift to be precisely controlled. This reduces turbulence and improves the valve’s performance which means that the flow rate of the valve remains accurate and consistent – a fact which has been proved by repeated testing. Fort Vale reports that, while the new 80mm flanged Hyper Maxi will be phased in to replace the existing 80mm Super Maxi model, the supply of the current range of 65mm bore and 65-80mm tapered bore Super Maxi valves will continue. It is planned to incorporate the ‘lift stop’ safety feature across Fort Vale’s range of relief valves and this process has already started with the 65mm Super Maxi range.